I’ve been wanting a gel pen refill for my Squire since I got the thing. 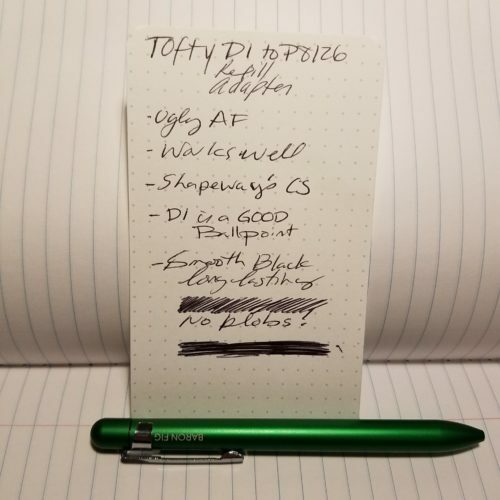 Don’t get me wrong I love the Schmidt P8126 refill that comes with them, but I love gel ink, particularly on the paper at work. As I’ve detailed before, my DayJob has the finest cheapest crappy printer paper, and everything bleeds on it. Gel pens seem to perform the best. Well, that and ballpoint. After a chat with Ana of The Well-Appointed Desk, I tested out a bunch of the gel refills I had around on my desk. 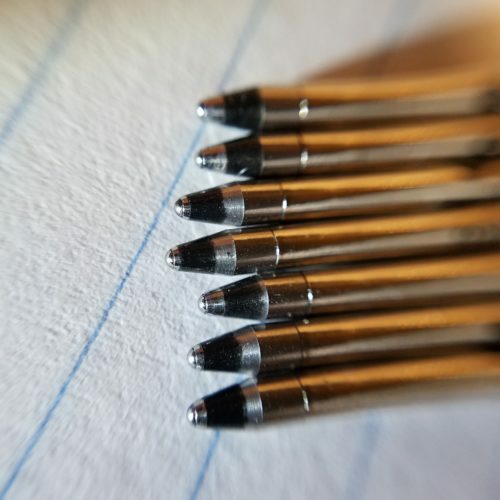 Only to continue the conversation (as pen nerds do) and find that Baron Fig had narrowed up the nose of the Squire and it will only accept a few refills, namely those with a tip roughly the same diameter of the P8126. This leaves you with using standard Parker type refills, and Parker does make a lovely gel refill that I destroy in under a week. But in my discussion with Ana, she suggested Tofty and his adapters. I headed over to Shapeways and Tofty’s page and ordered a few adapters. 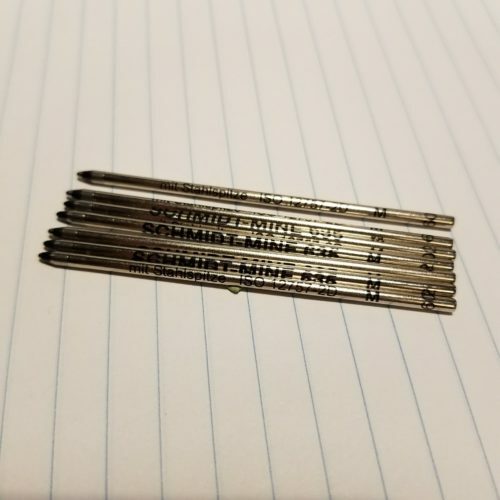 I also ordered some Schmidt D1 ballpoint refills. D1 refills are a steal on the ‘Zon, I snagged a 10-pack for cheap. Are they the best? No. As far as ballpoints go, they aren’t bad. They write smoothly and don’t blob. Anyway. The D1 refill slide into the adapter- BE CAREFUL the adapters should be snug and hold onto that refill like, well you make up your own metaphor/simile here, my mind isn’t going to good places. It takes a bit of effort to get the refill into the adapter but once it is in there, it STAYS in there. 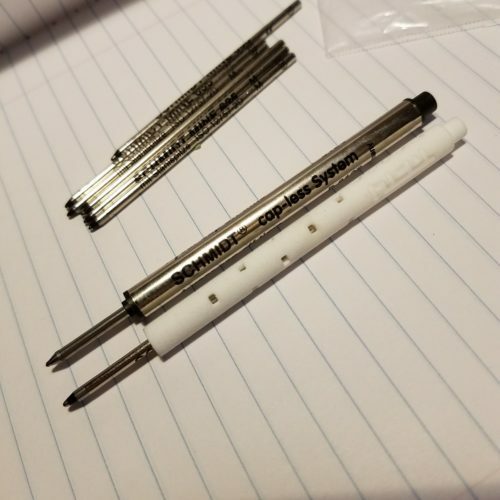 I found it helpful to get the refill started into the adapter, install it into my pen and then press the tip of the refill straight down into a pad of paper, which fully seats the refill every time. To remove the refill, take it out of the pen, hold the adapter in on hand and grip the D1 refill with a pair of plier and yank. Like most of the Shapeways stuff, I’ve picked up… The plastic looks cheap, feel fragile, and gets filthy in moments. It doesn’t matter so much with these adapters because they live inside the pen and so long as it’s not a transparent pen, they are hidden. Thus far I’ve been using one inside a Squire for a few months and I’ve been happy with the change. It does its job well. At $5.50 the price is… A little high in my mind. BUT over time and with 10 D1 refills over P8126 you’ll save a few bucks. A quick note about customer service. When you purchase a Tofty product you buy it via Shapeways. If things are right you’ll have no issues, but if things are incorrect their customer service is ridiculous. I’ve ordered several adapters and one was so wrong the refill slid out. To get a replacement for the $4 part I had to send a video of the part being defective, multiple pictures, they asked me to measure the parts with CALIPERS and take pictures of the caliper measurements. This process took over a week. For.a.goddamn.4.dollar.piece. I’ve wanted to order a few other things from them but this horrible CS experience makes me want to wait until I REALLY want another item. In the end YMMV. 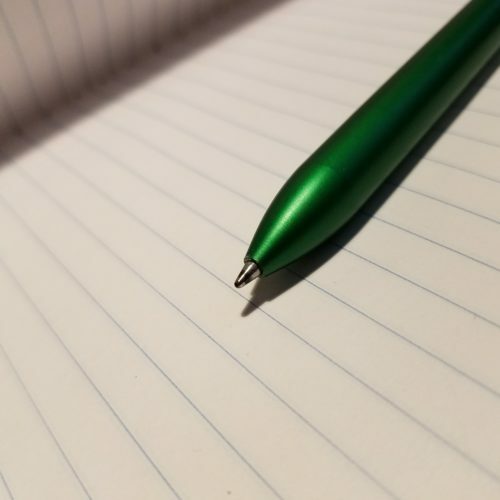 This entry was posted in Review on 20180619 by leslie.